Join us to celebrate FC Cincinnati's season home game opener vs the Portland Timbers. 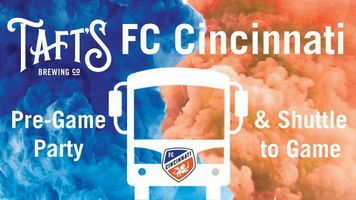 Your ticket gets you a guaranteed spot on one of two shuttle trips over to the game from the Brewpourium and a specialty Taft's/FC Cincy beaded necklace. PLUS, you'll be entered to win hourly prizes like Taft's/FC Cincy jerseys, Taft's gift cards, FC Cincy tickets, Taft's t-shirts and more! If you're not going to the game, we'll be featuring it on all of our screens so you can relax and enjoy a pizza and brew while cheering them on. LIMITED TICKETS are available to guarantee shuttle seat spots. The shuttle will be making 2 trips to Nippert Stadium at 3:30PM and 4:15PM for the 5PM kick off.